Here is the bookshelf we made for Nora's school auction. Like Madison's, I really don't think photos do it justice. I really think it is adorable. We made it into a stuffed animal zoo. Thanks to Family Fun magazine for the inspiration. The top shelf has elastic "bars" going across to put the stuffed animals into it. SUPER CUTE!!!! For the art I used this book and made a handprint animal with each student. They each got to choose their own animal and we had lion, tarantula, elephant, dolphin and more! My favorites were the seahorses and, of course, Nora's flamingo!! ADORABLE!!! We ended up buying the bookcase back at the auction and I think it looks so sweet in Nora's room. She loves putting the animals in and out of it and with our over-abundance of stuffed-animals it is nice to have a place for some of them. **update #1 - Madison's bookshelf is currently being bid on with her school on-line auction. After getting Nora's, I had every intention of getting hers too, but someone has bid it up to $131 and I am not sure I am willing to go higher, even though I know the $$ goes to a good cause. Though I am a bit disappointed since the high bidder does not have a child in Madison's class and the sentimental side of me really wants it to go to someone in the class. So I may end up putting in a last minute high bid to try and win it. If I don't we will build another shelf for Madison and she can personalize it herself. **update #2 - laptop is still dead, I need to call Dell today to see what we need to do to get it in working order again. But I (okay, Tom) got some of the problems figured out on the dinosaur desktop so I can do most things on there. I am just stuck in one place to do it, I miss the laptop freedom but it is good for me! My laptop completely died this week:-( I guess the motherboard is toast (yes that is the technical term). Good news, it is still under warranty; bad news is it will be out of commission for a bit. Luckily my brother-in-law got our dieing desktop to a semi-working condition when they were out for vacation but it is not cooperating too much. I can read emails and check blogs but can't access facebook or post pictures on my blog (what is the sense of blogging if I can't put photos on???) Yes, I am having a bit of with-drawl symptoms. I suppose it is good for me. 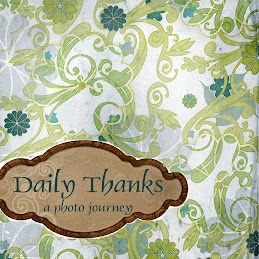 So I have many photos and posts waiting to go but I am not sure when I will be back up and running! The girls offering to the Easter Bunny. They wanted to bake something for him like we made cookies for Santa but I assured them that he prefers nice veggies. A carrot just wasn't enough so they made a "veggie tray". I am sure he will enjoy it. Easter egg coloring is always a favorite activity of mine and it did not disappoint this year. Lots of wonderful creations waiting for the Bunny to hide tonight! We hope you all have a wonderful Easter!!! Fingers crossed that the weather will cooperate for an outdoor egg hunt with friends, but the weather report isn't too hopeful. School auctions are coming up in the next few weeks and I volunteered to do the art projects for both girls' classes. I have pretty much wrapped up Madison's class project. The students did these oil pastel/watercolor flowers that were inspired by Georgia O'Keefe artwork. They were to use contrasting colors between the drawing and painting. It was a very simple project but I wanted to make sure that the end product was unified and similar enough that it wouldn't look to crazy when put all together. And it ensured success for all the students. I then made color copies of the flowers and cut them out. Tom built a bookshelf that I painted and then decoupaged the flowers onto. I put vinyl cricut letters on and will add a personalized name for the buyer (ex: Madison's Library). I need to take it into school to get the students to sign the back and add a class photo with that. When taking photos for the online auction listing I felt that it looked a bit blah, so had to "stage" it a bit and now think it looks adorable. I have a feeling there is a good chance the bookshelf will be coming right back to find a permanent home in Madison's room. It feels good to have one project down, as I have been stressing for quite some time about it. I am about half-way done with Nora's project (also a bookcase, but a different fun twist that I am excited to share) and hope to get it wrapped up by the end of next week. My sister and family came for a rare visit last weekend. It is always wonderful to get the cousins together and we are fortunate that they are the same ages and get along so well. Especially since they are the only cousins that any of them will ever have! 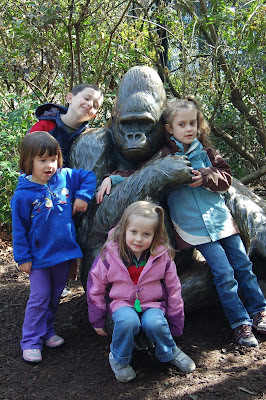 We enjoyed going to the zoo on Saturday and had amazing weather! The gorillas were especially entertaining. I also have some cute bathtub photos of the girl cousins, but alwaysfeel a bit unsure about posting those so I will have to print them for Grandma to see. 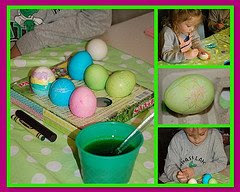 Looking for new and fun spring projects to do with the kids??? Click on over to Kiddio's Craft Jamboree for tons of great links!!! And don't forget the always fabulous Crafty Crow! No problem finding projects that interest me, the only problem is finding the time to do them!!! The other day Tom and I were recalling April Fool's Day of 1996. We were living in Missoula, MT at the time and the week prior both Tom and I had job interviews on the same day. Mine was for a teaching position in some itty-bitty-teeny-tiny Montana town. I had to drive through a blizzard and over a mountain pass (that I later found out was supposed to be closed, but somehow I didn't get that memo) in white-out conditions to get there. And then I got stuck in a snow drift right in front of the school and had to attempt to walk out of it in my interview clothes and find a tow-truck in the town to get me out. It was an interesting interview, to say the least. Tom's interview took place in Spokane, but was a tele-conference for a position in Seattle at the buying office for the Bon-Marche. We had no clue what would happen if we both were offered the positions. Seattle or rural Montana???? HMMMMM, I guess you can figure out what happened there. So fast forward to April 1st. I was at work and got a call from Tom saying he got offered the position and they wanted him to start in 4 weeks and would fly us out the following week to find housing. I was completely overwhelmed and excited and hung up the phone. My mind was racing with the thoughts of what needed done, how I was going to learn to drive in Seattle, how we would afford it.......... About 30 minutes later I realize what the date is and call back to tell Tom this would be a very cruel April Fool's joke, but he assured me it was not. The moral of the story? If you are in a hiring position, please consider a day other than April 1st to call your job applicants about their employment future! And that is my mindless ramble for the day! Okay, I am not much of a prankster and humor isn't really a big personality trait of mine but Madison has been talking about April Fool's Day for the past week. I am thinking first grade is about the prime age for this, able to do silly tricks on people and run around giggling!!! So, with the help of Family Fun Magazine, I packed an April Fool's Day lunch. 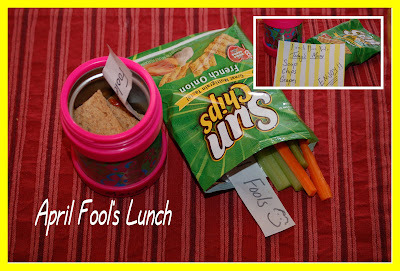 For her lunchbox note I wrote the expected menu and then she will be suprised when she opens her thermos and chip bag to find sandwiches and veggie sticks! That, is about the extent of my pranking abilities, obviously I will need to start researching now for next year. And just a note about lunch box notes...... I absolutely love having this stack of note paper for writing her quick notes each morning (I have forgotten probably 3 times the whole year and you better believe I hear about it after school!) and also sending in notes to the office. I keep the notepads in a little box with a supply of stickers, a variety of pens and a joke book for days I am stuck on what to write. I keep the box in the pantry by the often used lunch supplies (i.e. peanut butter!!) to help me remember. I am hoping this supply will last through the year and then plan to make my own notes with stamps and supplies for next year. Mother Nature decided to pull a prank on all of us. We thought spring may be coming but APRIL FOOLS back to SNOW!!!!!! !